Parents of Jesse Romero angered by LAPD Police Commission decisions | Fight Back! 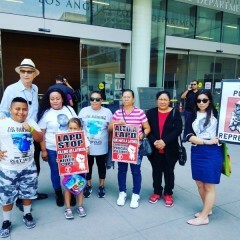 Los Angeles - Chants like, “Fire Chief Beck,” flooded the packed Police Commission meeting at Los Angeles Police Department (LAPD) headquarters today, July 25. Teresa Dominguez and Jesus Romero, parents of late 14-year-old Jesse Romero, killed by the LAPD Feb. 6, 2016, attended their first LAPD Police Commission meeting. The commission wound up justifying the use of deadly force by LAPD in both Kenney Watkins and Jesse Romero cases and ruling the killings within policy. Romero’s parents were joined by Centro Community Service Organization (CSO) members Luis Sifuentes, Carlos Montes, Sol Marquez, Estela Rodriguez and Josefina Rizo, along with Black Lives Matter-LA, Stop LAPD Spying Coalition, and the families of the late Jose Mendez, Edwin Rodriguez, and Carlos Oliva. Repeatedly activists and family members demanded answers from Chief Beck and Commissioner Matt Johnson. And repeatedly Chief Beck and the commission reacted defiantly, twice forcing the meeting into recess, with the commission president threatening to end it. In addition to the Police Commission meeting, Teresa Dominguez and Jesus Romero and a delegation attended the LA city council meeting, attempting to speak with Boyle Heights Councilmember Jose Huizar and Mayor Eric Garcetti. Neither were available according to staff, but the parents warned they will be following up with appointments. The families are all calling for an independent investigation of LAPD Hollenbeck police station by California Attorney General Xavier Becerra. Alarming killings and brutality include: Five Boyle Heights, young, Chicanos who were killed in 2016 by LAPD Hollenbeck; the Feb. 16 tasing of Carlos “Charlie” Gonzalez by LAPD - ultimately causing his death; the shooting and killing March 26 of Fred Barragan by LAPD at the Soto metro station in Boyle Heights; and the shooting of Pedro Echeverria on June 8. Echeverria is 18 years old and had graduated from Central High School the day before he was shot. His shooting occurred at 3 p.m. on a neighbor’s front yard. He was shot four times by LAPD, but survived due to intervention by a neighbor yelling at cops to stop shooting him. Centro CSO is pushing for unity and support from neighborhoods in Boyle Heights and East LA, along with families affected by LAPD and LA Sheriffs’ violence. 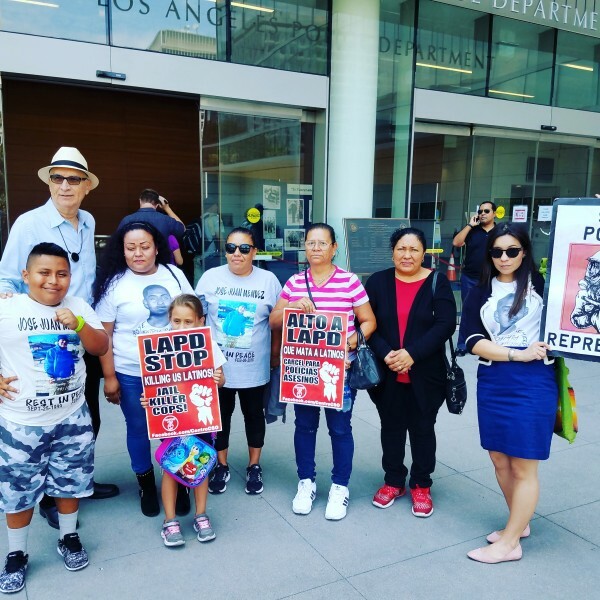 CSO and the families plan on attending the Boyle Heights Neighborhood Council meeting on July 26, where they hope to obtain even more support from local leaders. CSO members plan on marching in the National Night Out on August 1 - which is annually hosted by the LAPD. Centro CSO is asking families and activists in California to contact them about their local police killings, and unite in a statewide network against police killings. Contact Cento CSO at [email protected] or 323-943-2030 or at http://twitter.com/CentroCSO.